Press play then scroll down. Ludo used to play us French music like Francis Cabrel and Calogero. We would then go through and translate the lyrics into English. It helped a great deal and if it wasn't for Ludo and Mike Rylance, I don't think I'd be doing so great with my French and Kreol in Seychelles right now. In the morning, I finished shooting the video for my mum's 50th. Don't worry, you'll all get to see it at some point. Boaty M is expecting some kind of Hollywood blockbuster, but it's mainly me just talking. 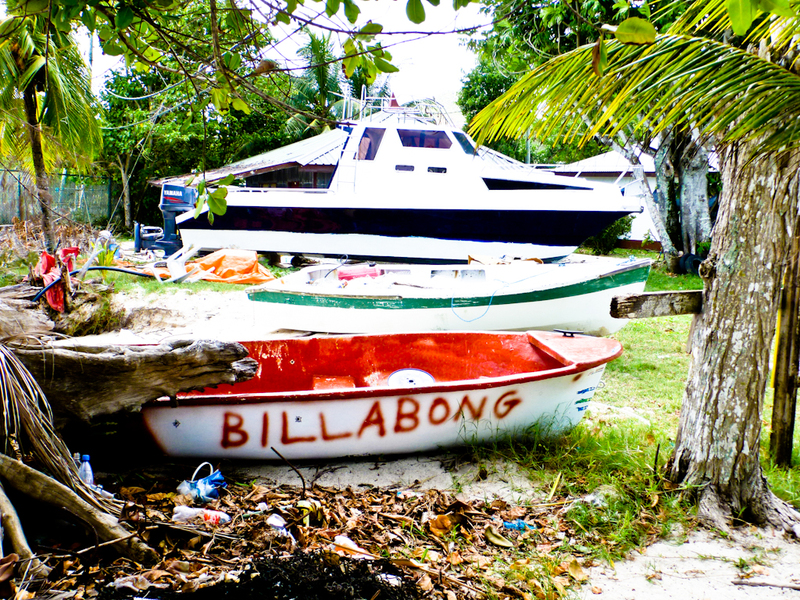 En-route to the beach, I saw this Billabong boat, it is owned by the same guy who owns the Yacht in the background. This makes me think that maybe the Billabong boat is a toy for the kids. Eitherway Graff is alive and kicking in Seychelles. 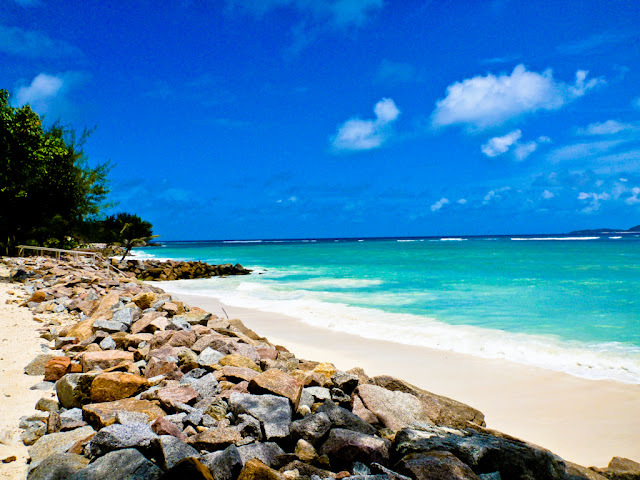 Here's the local beach, Castello beach. 5 mins 30 seconds from the house. Don't go too far past the Billabong boat though, as the guy who owns it also owns two rabid dogs. Now where's that poison at? Just kidding! 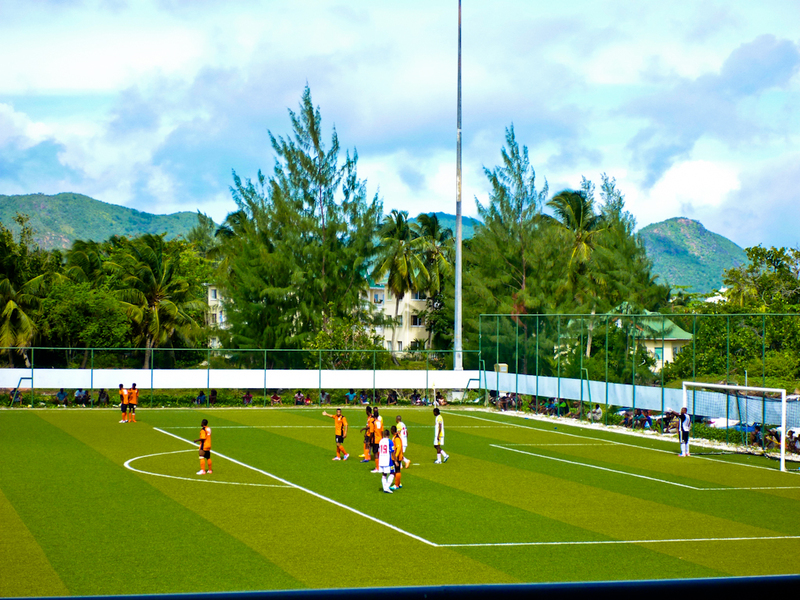 There are two football teams on Praslin, the Lightstars and Côte d'Or. The latter were once bottom of the league, but they've been recently rescued by an Abramovitch-esque investor who has poured in SR 1 000,000 into the team. That's £48,240 which is completely unheard of in Seychellois football. Back to Côte d'Or. I'd love to say that they played a form of "Total Football" that Johan would be proud of, but unfortunately the £1 ticket was only justified by the banter and animosity from the stands. The chants and vuvuzuela's added atmos to the sole stand in the stadium. Vijay stadium of course-the legend builds everything. 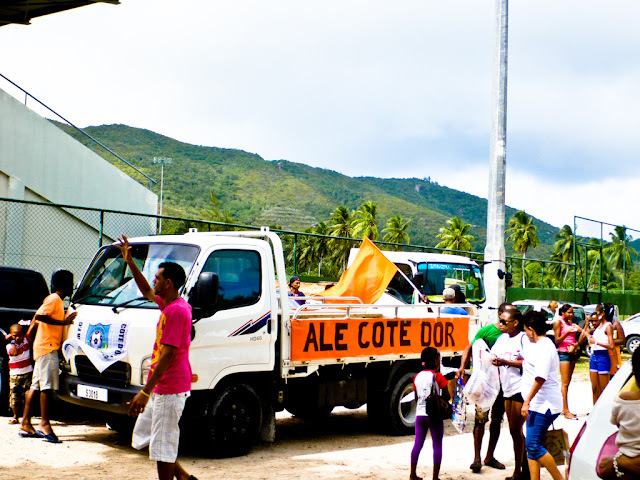 Pick-up trucks like these drive to the game with 20 or 30 passengers in the back, picking up supporters on their way along the road. 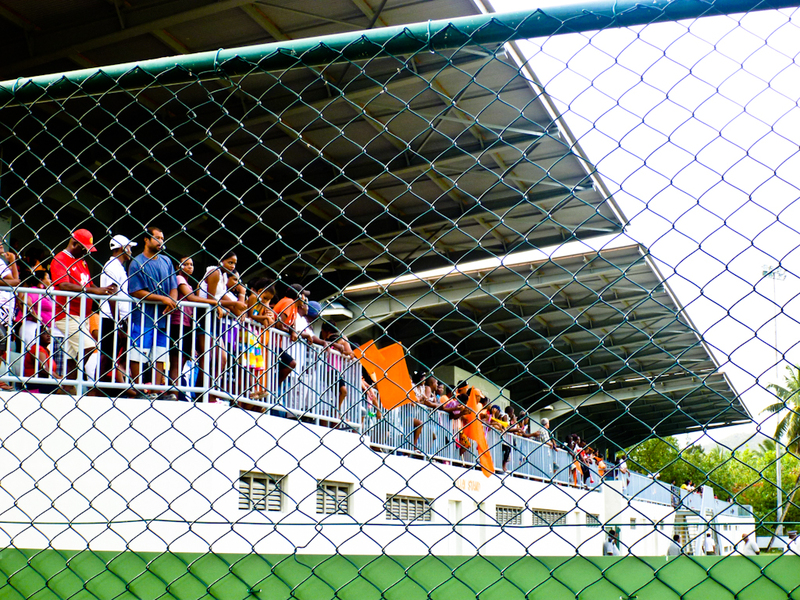 Eventhough the team drew 0-0 with St Michel from Mahé, the crowd were still fairly celebratory, acting asthough it was a 2-0 win or something. We drove back in their convoy towards Côte d'Or honking our horn with the locals, I think they just love the social aspect of it all. As one of our colleagues P said, "You have to celebrate life, you don't know when it's going to be over". After today's drive home, I know exactly what she means. 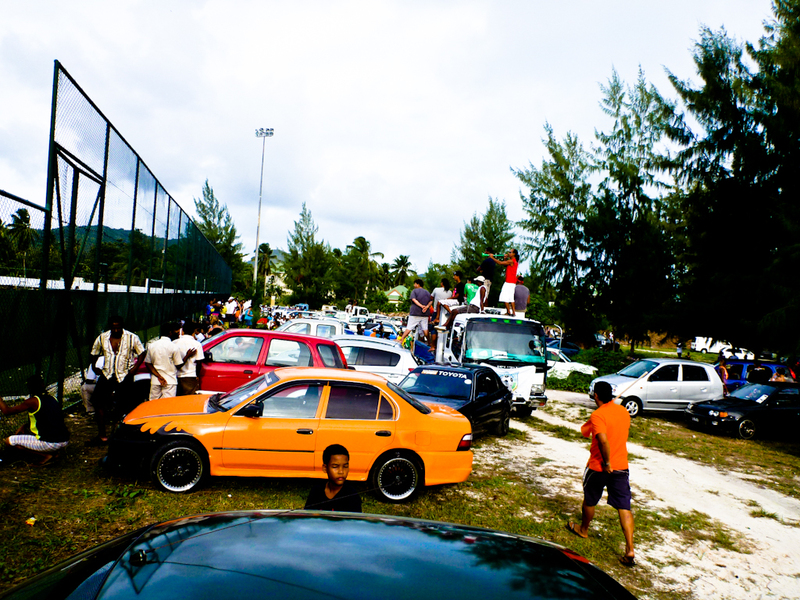 It reminded me a bit of Indian cricket, with lost of supporters on the other side of the fence. Some are on this side as the 25 rupees isn't that great an investment, considering 23 would buy you a Seybrew and 40 would buy you a bag of Ti Shot. More on Ti Shot later! You can't drink in the stands, the only food and beverages sold are water, popcorn, ice cream, banana chips and mini-pizzas. It's good to know that Stadium food is unhealthy across the globe. 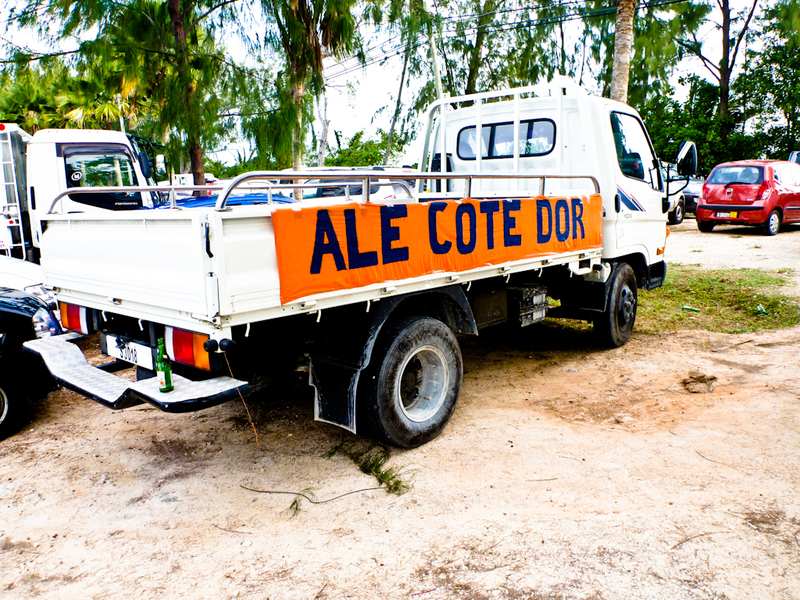 Côte d'Or-Mobile below. A gang of orange-bandana wearing bretheran got out from this classy ride, they're the equivalent of the local firm. That's all for today, I'm still back-dating my blog, but today was our first day at school. A good friend, "A" once said to me that she knew from the first day that she stepped foot in a certain school, that she didn't want to stay there. I would say the same, only the opposite; from Day One alone I can't imagine leaving this place.